Download "TECHNOLOGY STUDENTS GYMKHANAINDIAN INSTITUTE OF TECHNOLOGY KHARAGPUR 721 302, INDIA. No.IIT/TSG/ENQ/2015-16/RLM-01 Date: 14.12." 3 GENERAL TERMS and CONDITIONS (1) Price may be quoted in foreign currency for imported items. Manufacturer/Indian Agents of OEM should submit two-parts bid, Technical and Commercial bid in separate sealed envelopes. The technical bid should have a copy of commercial bid with prices masked. Modules to be supplied by the Indian Agent from Indigenous sources must be with ISO 9001 or equivalent certification and unit prices of such modules must be given in Rupees. The main equipment as well as the modules should have warranty of One year. (2) Only those manufacturers/their Indian Agents are eligible to quote who have supplied and installed at least ten such equipment in India during the past two years. The bids must accompany copies of authentic user s certificates on successful installations in India. 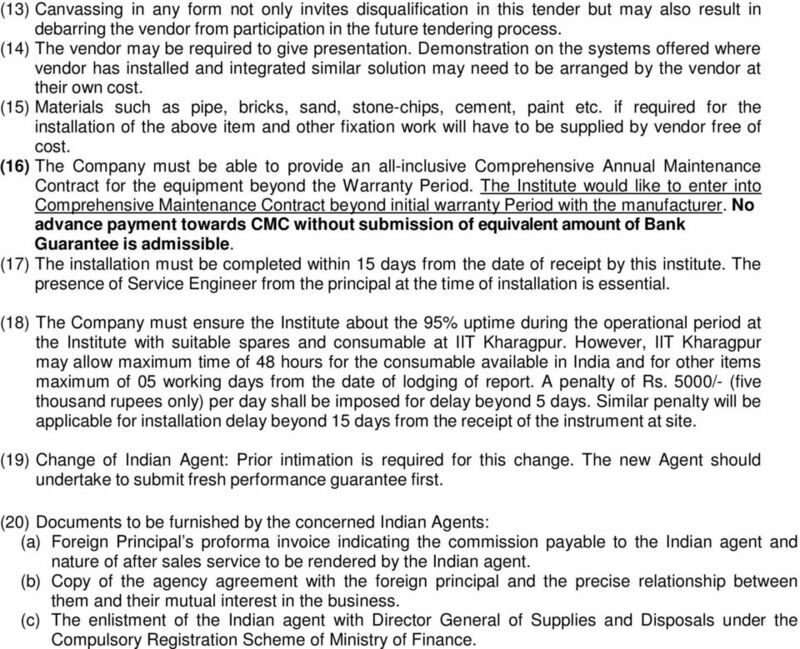 IIT Kharagpur reserves the right to verify confidentially the information in this regard from the users) and (a) Provide the name of the Indian Agent who will be responsible for maintaining the equipment during the entire period under warranty and CMC (b) Provide names of service engineer who are posted in India; the service engineers should have been trained at Original Equipment Manufacturers (OEM s) own unit. (3) While submitting the technical bid, the company must undertake to ensure continued availability of adequate number of technically qualified Service Engineers for the Equipment during the period of supply, installation and throughout the warranty period. (4) Period of validity: Bids shall remain valid for acceptance for a period of Four months(120 days) from the date of opening of Price Bids. (5) Conditional offer will not be accepted. (6) Late Tenders:- Tender received after the due date and time of submission as mentioned below shall not be accepted. (7) Indian Agents of Bidders or Indian Agents who are bidding on behalf of their principals are to enclose the following documents: (a) Current Sales Tax clearance certificates and PAN No. (b) Banker s Solvency Certificate. (c) Summary of Audited statement of Accounts for the last three years to be enclosed and financial highlights and the key performance during the last three quarters to be enclosed as per format: Company s Key Performance Description. April to June July to Sept. Oct. to Dec. Gross Revenue Profit Before Tax Profit After Tax Return on Invested Capital (ROIC) (8) (a) Name and Address, phone and address of minimum five clients, out of which at least One should be in India to whom such/similar equipment have been supplied during the past two years should be mentioned. (b) Customer satisfaction certificate from one such organization is to be attached with the technical bid. (9) All Tenders (unless otherwise specified) are to be submitted/handed over to The President, TSG IIT Kharagpur and acknowledgement to be obtained. (10) The person attending the bid opening session should be delegated with appropriate Power of Attorney (duly endorsed by a Notary Public) by the Chief Executive Officer of the Company to sign such documents. Only two persons on behalf of each Company will be allowed to participate/attend the Bid opening session. 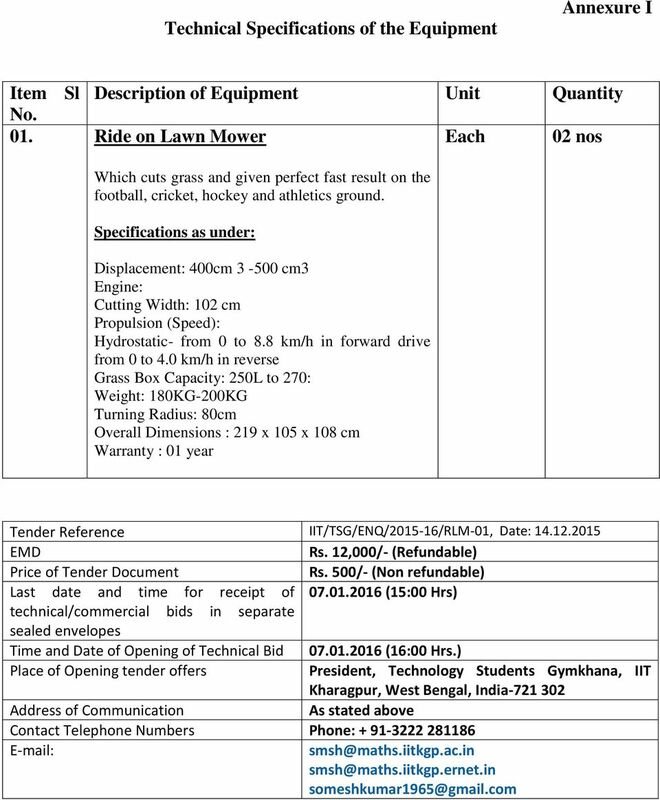 (11) Bid once submitted shall be the property of IIT Kharagpur and shall not be returned to the vendor at any time. (12) A bid submitted with false information will not only be rejected but the vendor may also be debarred from participation in future tendering process. 4 (13) Canvassing in any form not only invites disqualification in this tender but may also result in debarring the vendor from participation in the future tendering process. (14) The vendor may be required to give presentation. Demonstration on the systems offered where vendor has installed and integrated similar solution may need to be arranged by the vendor at their own cost. (15) Materials such as pipe, bricks, sand, stone-chips, cement, paint etc. if required for the installation of the above item and other fixation work will have to be supplied by vendor free of cost. (16) The Company must be able to provide an all-inclusive Comprehensive Annual Maintenance Contract for the equipment beyond the Warranty Period. The Institute would like to enter into Comprehensive Maintenance Contract beyond initial warranty Period with the manufacturer. No advance payment towards CMC without submission of equivalent amount of Bank Guarantee is admissible. (17) The installation must be completed within 15 days from the date of receipt by this institute. The presence of Service Engineer from the principal at the time of installation is essential. (18) The Company must ensure the Institute about the 95% uptime during the operational period at the Institute with suitable spares and consumable at IIT Kharagpur. However, IIT Kharagpur may allow maximum time of 48 hours for the consumable available in India and for other items maximum of 05 working days from the date of lodging of report. A penalty of Rs. 5000/- (five thousand rupees only) per day shall be imposed for delay beyond 5 days. Similar penalty will be applicable for installation delay beyond 15 days from the receipt of the instrument at site. (19) Change of Indian Agent: Prior intimation is required for this change. The new Agent should undertake to submit fresh performance guarantee first. (20) Documents to be furnished by the concerned Indian Agents: (a) Foreign Principal s proforma invoice indicating the commission payable to the Indian agent and nature of after sales service to be rendered by the Indian agent. (b) Copy of the agency agreement with the foreign principal and the precise relationship between them and their mutual interest in the business. (c) The enlistment of the Indian agent with Director General of Supplies and Disposals under the Compulsory Registration Scheme of Ministry of Finance. 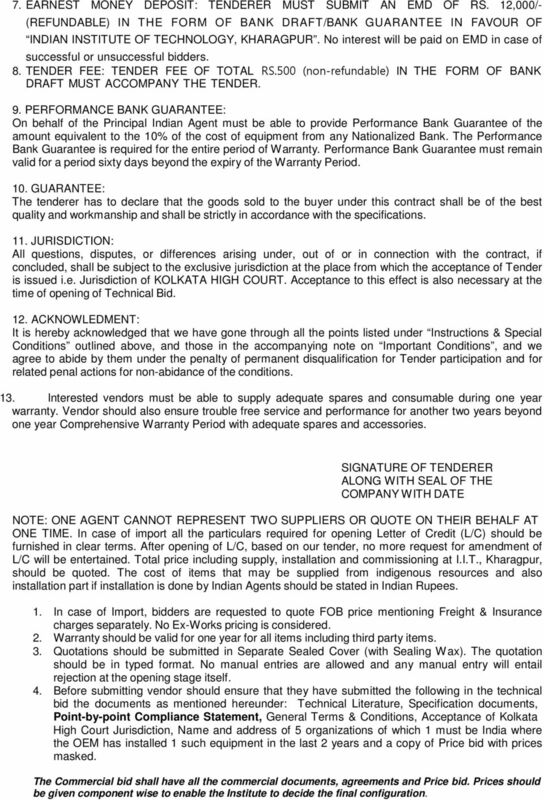 5 ANNEXURE III INSTRUCTIONS & SPECIAL CONDITIONS (To be returned by Tenderer along with the Tender duly signed) 1. GENERAL: Tenderer, who are Indian Agents of OEMs, should furnish a clear declaration as follows: We declare that I am/we are Accredited Agents of the suppliers aboard; 2. DEVIATION FROM SPECIFICATIONS: It is in the interest of the tenderer to study the specifications in the tender schedule thoroughly before quoting so that, if the tenderer makes any deviations, the same are prominently brought out in the body of the tender. If you need to add any optional items to your system in order to meet our specifications, you are requested to quote for the total including the option required to suit our requirements; otherwise, your tender will not be considered at all. 3. PRICE: For imported items both F.O.B. & C.I.F. Kolkata price by Air to be quoted. The price should be without Customs Duty and Excise Duty since IIT Kharagpur is exempted from the payment of Customs & Excise Duties. The Institute if required will provide certificates for Import Items: The order acknowledgement should be issued by Fax within 3 days, and the item should be airlifted within 30 days from the date of receipt of the Letter of Credit copy / copy of DD, as the case may be. (i) Agency Commission, if any will be paid to the Indian agents in Rupees on receipt of the equipment and after satisfactory installation. Agency Commission will not be paid in foreign currency under any circumstances. (ii) The unit prices should be for the same unit as indicated in the Schedule to tender enquiry and not for any other unit. (iii) Prices quoted should be for supply, installation and commissioning at I.I.T. Kharagpur. (iv) Discount, if any, should be indicated separately / prominently. (v) Offers should normally be on fixed and firm price basis. Any clause making price variation will not be acceptable. (vi) Where tenderer intends to quote in Indian Rupees, for imported items, the price should be quoted FOR Destination basis. Offer should be on High Sea Sales basis. No sales tax can be charged. Customs Duty applicable against Declaration in Terms of Government of India Notification No.51/96-Customs dated will be paid. Vendor will arrange payment of customs duty during clearance and the same will be reimbursed at actual against proper documents. Way Bill will be issued on request. Seller has to undertake the responsibilities of customs clearance. All necessary supporting documents will be provided by the IIT Kharagpur. An agreement can be made in this regard, if the seller wishes, before customs clearance. 4. TRANSIT NSURANCE: The Purchaser will not pay separately for Transit Insurance. 5. PAYMENT: i) Payment for indigenous items quoted in Indian Rupees will be made only after completion of supply, installation and commissioning of the Systems to the entire satisfaction of the Purchaser. No Advance Payment will be made for Indigenous Purchase. ii) Where items are imported and the payment is desired to be made to their foreign Principals directly, the same will be made against Irrevocable Letter of Credit only. 6. TENDERERS SHALL SUBMIT ALONG WITH THEIR TENDER: i) Complete address and tele links for contact persons in principals and Indian agent offices dealing with this purchase. ii) Name and full address of the OEM s Banker and their swift code. iii) Proof of having ISO 9001 or other equivalent certification given by appropriate authorities. 6 7. EARNEST MONEY DEPOSIT: TENDERER MUST SUBMIT AN EMD OF RS. 12,000/- (REFUNDABLE) IN THE FORM OF BANK DRAFT/BANK GUARANTEE IN FAVOUR OF INDIAN INSTITUTE OF TECHNOLOGY, KHARAGPUR. No interest will be paid on EMD in case of successful or unsuccessful bidders. 8. TENDER FEE: TENDER FEE OF TOTAL RS.500 (non-refundable) IN THE FORM OF BANK DRAFT MUST ACCOMPANY THE TENDER. 9. PERFORMANCE BANK GUARANTEE: On behalf of the Principal Indian Agent must be able to provide Performance Bank Guarantee of the amount equivalent to the 10% of the cost of equipment from any Nationalized Bank. The Performance Bank Guarantee is required for the entire period of Warranty. Performance Bank Guarantee must remain valid for a period sixty days beyond the expiry of the Warranty Period. 10. GUARANTEE: The tenderer has to declare that the goods sold to the buyer under this contract shall be of the best quality and workmanship and shall be strictly in accordance with the specifications. 11. JURISDICTION: All questions, disputes, or differences arising under, out of or in connection with the contract, if concluded, shall be subject to the exclusive jurisdiction at the place from which the acceptance of Tender is issued i.e. Jurisdiction of KOLKATA HIGH COURT. Acceptance to this effect is also necessary at the time of opening of Technical Bid. 12. ACKNOWLEDMENT: It is hereby acknowledged that we have gone through all the points listed under Instructions & Special Conditions outlined above, and those in the accompanying note on Important Conditions, and we agree to abide by them under the penalty of permanent disqualification for Tender participation and for related penal actions for non-abidance of the conditions. 13. Interested vendors must be able to supply adequate spares and consumable during one year warranty. Vendor should also ensure trouble free service and performance for another two years beyond one year Comprehensive Warranty Period with adequate spares and accessories. SIGNATURE OF TENDERER ALONG WITH SEAL OF THE COMPANY WITH DATE NOTE: ONE AGENT CANNOT REPRESENT TWO SUPPLIERS OR QUOTE ON THEIR BEHALF AT ONE TIME. In case of import all the particulars required for opening Letter of Credit (L/C) should be furnished in clear terms. After opening of L/C, based on our tender, no more request for amendment of L/C will be entertained. Total price including supply, installation and commissioning at I.I.T., Kharagpur, should be quoted. The cost of items that may be supplied from indigenous resources and also installation part if installation is done by Indian Agents should be stated in Indian Rupees. 1. 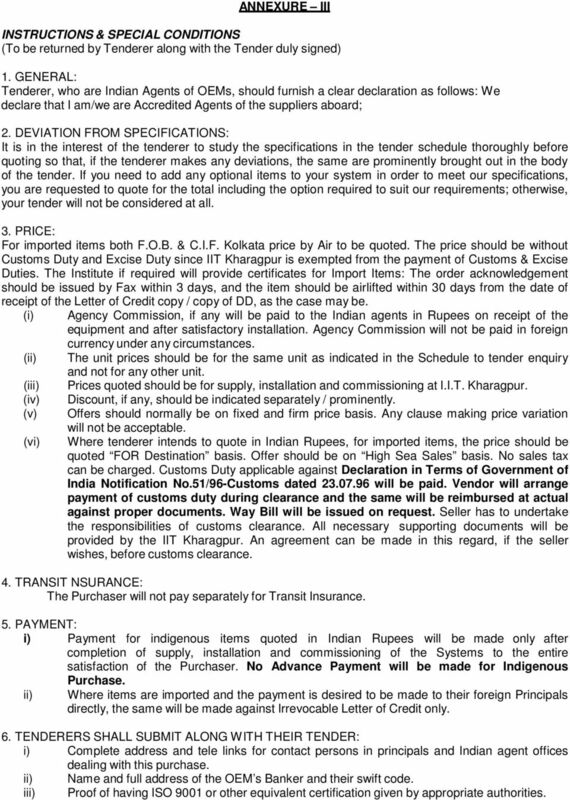 In case of Import, bidders are requested to quote FOB price mentioning Freight & Insurance charges separately. No Ex-Works pricing is considered. 2. Warranty should be valid for one year for all items including third party items. 3. Quotations should be submitted in Separate Sealed Cover (with Sealing Wax). The quotation should be in typed format. No manual entries are allowed and any manual entry will entail rejection at the opening stage itself. 4. Before submitting vendor should ensure that they have submitted the following in the technical bid the documents as mentioned hereunder: Technical Literature, Specification documents, Point-by-point Compliance Statement, General Terms & Conditions, Acceptance of Kolkata High Court Jurisdiction, Name and address of 5 organizations of which 1 must be India where the OEM has installed 1 such equipment in the last 2 years and a copy of Price bid with prices masked. The Commercial bid shall have all the commercial documents, agreements and Price bid. Prices should be given component wise to enable the Institute to decide the final configuration. 7 Important : 1. The institute may accept or reject any or all the bids in part or in full without assigning any reason and does not bind him to accept the lowest bid. The Institute at its discretion may change the quantity/upgrade the criteria/drop any item or part thereof at any time before placing the Purchase Order. 2. In case of any dispute, the decision of the Registrar of this Institute shall be final and binding on the Bidders. 3. 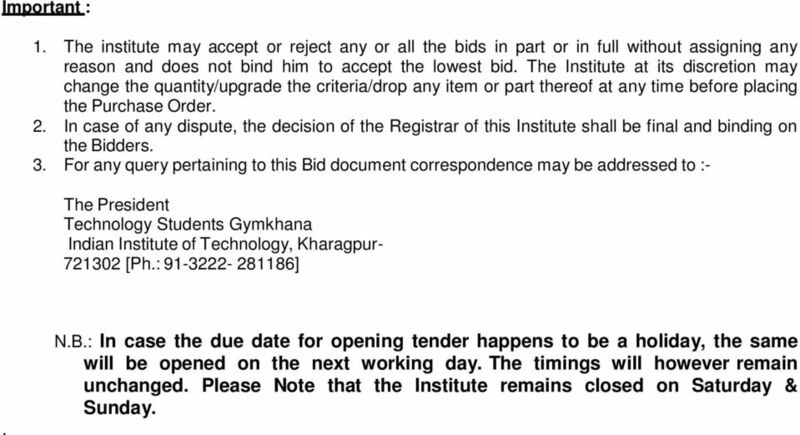 For any query pertaining to this Bid document correspondence may be addressed to :- The President Technology Students Gymkhana Indian Institute of Technology, Kharagpur [Ph. : ]. N.B. : In case the due date for opening tender happens to be a holiday, the same will be opened on the next working day. The timings will however remain unchanged. Please Note that the Institute remains closed on Saturday & Sunday. 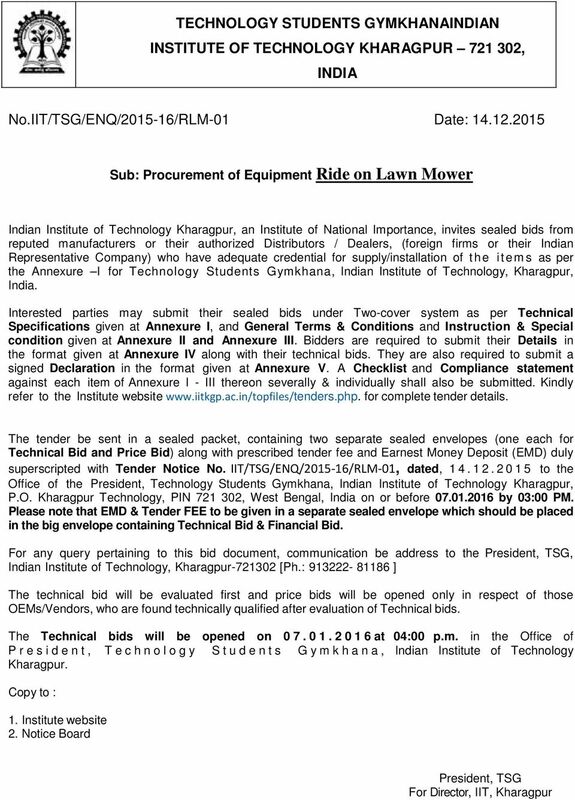 8 TECHNICAL BID DOCUMENT ANNEXURE IV FORMAT TO BE FILLED BY THE MANUFACTURERS / INDIAN AGENTS (ON BEHALF OF THEIR FOREIGN PRINCIPLES) OR THEIR AUTHORIZED COUNTRY DISTRIBUTORS/ REPRESENTING DEALERS/ REGIONAL AGENCIES, SUBMITTING TENDER FOR SUPPLY RIDE ON LAWN MOWER FOR IIT KHARAGPUR 1. Name of the Tenderer : 2. 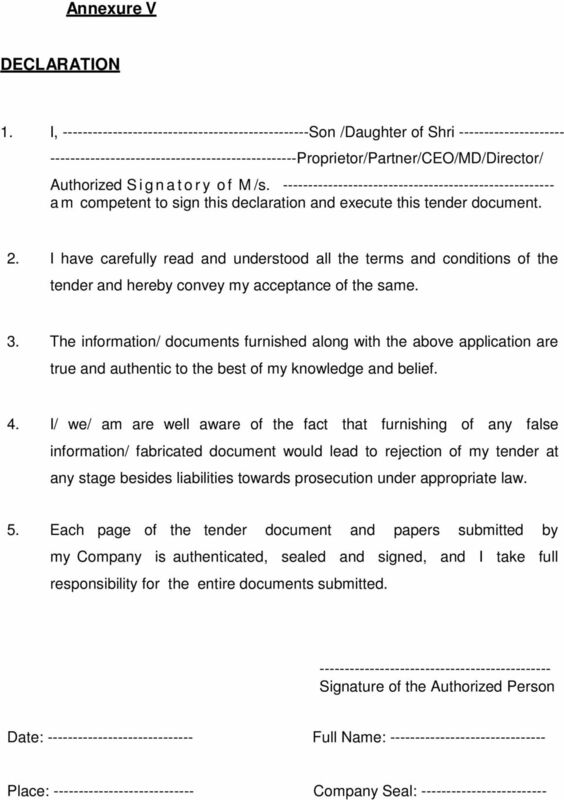 Status of the Tenderer : (attach documents, if registered company/partnership/proprietyship) 3. Whether OEM/representing foreign principle : (attach copy of certificate/authorization) 4. Details of key top official/authorized official : (attach details) 5. Details of tie-ups for supply/services, if any : (Attach details, agreements, escalation matrix) 6. Income Tax and Service Tax returns of previous three assessment year (copy) : 7. Financial status of bidder and/or his associates including Annual Report & Balance Sheet/Statement of Account of past three years with Registration of Companies (ROC) receipts duly authenticated by Chartered Accountant : 8. Current list/address of clients where similar material has been supplied and successfully working : 9. Name of the vendor's three largest clients, to whom similar products and services were extended & amount of transaction/annual bills to such clients : 10. Name and address of Vendor's bankers and attach a Solvency Certificate from the Bank for a minimum amount of Rs. 30 Lakhs : 11. Income Tax Permanent A/c No. (attach copy) : 12. 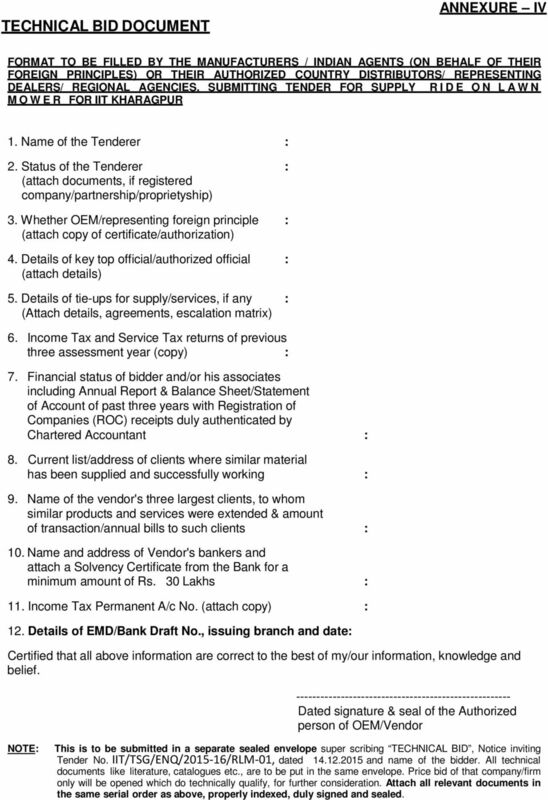 Details of EMD/Bank Draft No., issuing branch and date: Certified that all above information are correct to the best of my/our information, knowledge and belief Dated signature & seal of the Authorized person of OEM/Vendor NOTE: This is to be submitted in a separate sealed envelope super scribing TECHNICAL BID, Notice inviting Tender No. IIT/TSG/ENQ/ /RLM-01, dated and name of the bidder. All technical documents like literature, catalogues etc., are to be put in the same envelope. Price bid of that company/firm only will be opened which do technically qualify, for further consideration. Attach all relevant documents in the same serial order as above, properly indexed, duly signed and sealed. Terms and Conditions 1. The bidder must be an ISO certified organization. 2. The bidder should be Original Equipment Manufacturer (OEM) or authorized distributor of the OEM (attach documentary proof). 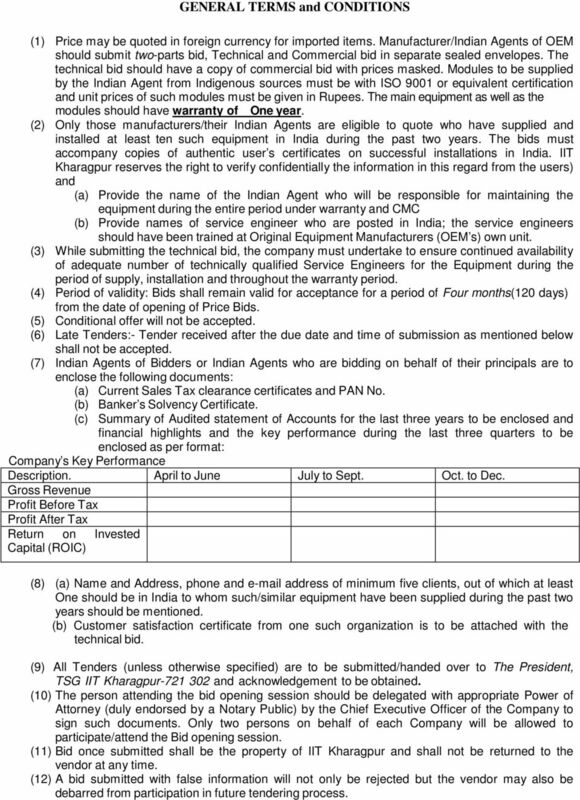 INVITATION FOR TENDER FOR SUPPLY OF EQUIPMENT Sealed tender offers are invited in sealed covers from eligible manufacturers/suppliers or their direct Indian agents for the supply of the following equipment. Tender Notice NSIC Technical Services Centre Okhla Industrial Estate, Phase-III, Near Govindpuri Metro Station, New Delhi-110020 Tel: +91-11-26826796/26826801/26826848 Email: ntscok@nsic.co.in Tender no. Ref No: 110003/2011-12/91/IT/Dir/ Date: 02/02/2012. Subject : Annual Contract for Pest Control, Rodent Control and Termite Control to the Commission for the year 2014-1 5. Sub: Indian Institute. bids from. Technical. Specifications Check list and. Institute website. The. Bid. dated: 01-02-2016, to the. pertaining. (14) Earnest Money Rs. 5000/- (Five thousand) only- refundable in the form of Demand Draft in the name of the Director IGIMS, Payable at Patna. TENDER FOR ANNUAL MAINTENANCE CONTRACT OF WEBSITEs OF O/O DIRECTORATE OF FILM FESTIVALS. Sub: Tender Enquiry for Sale of Condemned Items. TENDER NOTICE NO. 04/2015-16 Office of the Commissioner of Central Excise, Noida II invites sealed tenders in the shape of Two Bid System i.e. (Technical Bid & Price Bid) from reputed Indian Firms/Agencies/Govt. Bank of Baroda inviting tenders from Gujarat Based Reputed Printers for F.Y. 2015-16 with BOB Zonal Stationery Cell, Baroda. Ph. FINANCIAL INTELLIGENCE UNIT INDIA 6 th Floor, Hotel Samrat, Kautilaya Marg, Chanakya Puri, New Delhi 110021. 1 FINANCIAL INTELLIGENCE UNIT INDIA 6 th Floor, Hotel Samrat, Kautilaya Marg, Chanakya Puri, New Delhi 110021. To, F. No. : 4-5/2005-FIU(Admn. )(Vol.III) Dated: 01.10.2012 40 vendors as per list enclosed.